Arianne Abela ’08 had no intention of becoming a conductor until she came to Smith. Though music had always been a major part of her life (she sang in the San Francisco Girls Chorus for many years), she grew up as a left leg amputee and missing most of her fingers on both hands. “My hands have always been my greatest insecurity,” she says. But all that has changed. 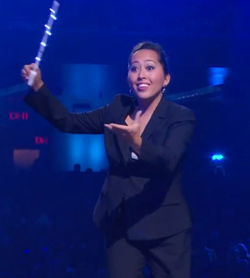 Abela, conductor of 3 Penny Chorus and Orchestra, has spent the summer competing on television’s America’s Got Talent with the ensemble she founded with Yale School of Music classmate Colin Britt. The 55-person, all-volunteer group includes professional musicians, but also individuals of all ages and from all walks of life. The goal of the orchestra is to perform pop music with a classical twist. “We want to show people that you don’t have to love just one kind of music,” says Abela. 3Penny first caught the world’s attention last year when a video of the group performing Carly Rae Jepsen’s 2012 smash hit “Call Me Maybe” (put together just “for fun”) went viral, racking up more than two million hits. An invitation to perform on the Today show soon followed, and that led to an opportunity to audition for America’s Got Talent. Abela, who holds a master’s in choral conducting from Yale, is passionate about using music to inspire and make the world a better place. A dedicated educator, until recently she was director of music at Notre Dame High School in West Haven, CT, before starting the doctoral program in choral conducting at the University of Michigan this fall. Her nonprofit, The House of Clouds, raises funds through performances for organizations that help people in need. Here she talks about 3Penny Chorus and Orchestra, her musical mission and picking up a conductor’s baton for the first time at Smith. How and why did you form 3Penny? The group is made up of friends from all over Connecticut, including the Yale and Hartt Schools of music. Group members were originally gleaned from our House of Clouds projects to make the YouTube video of “Call Me Maybe.” Our focus has been to do pop music with a classical twist. It is rare for such classically trained musicians to perform pop. It was so much fun for us, we decided to continue. What was it like to perform on America’s Got Talent? Reaching the final live rounds and performing live at Radio City Music Hall was quite a surprise! I have never conducted on a stage that size or for an audience that size. What was more special, though, was to be able to look up and see my friends singing for me with the same excitement and energy. It was an opportunity of a lifetime, and I think we are all so grateful it happened. Our motto the whole time was, if we inspired at least one child to start singing or pick up an instrument, then we did our job. Having grown up with a disability, music—singing, composing—became my refuge. But I never thought that I could become a conductor. Explain Smith’s role in leading to you conducting. Deanna Joseph was the college choir conductor during my first year at Smith. She was stuck in Pittsburgh over Thanksgiving and couldn’t make it back to campus for rehearsal. She called me up and asked me to conduct in her stead, and I was shocked that she would trust a first year! After conducting for her that day, I realized that I loved it, although I was still overcome with conflict about exposing my hands to people. Thereafter, Deanna and Jonathan Hirsh, Glee Club conductor and director of orchestral and choral activities, both pushed me to continue conducting. They saw something in me that I had not seen and kept encouraging me. Why do you love conducting? I am a nervous performer, especially when I have to face the audience. When I am conducting, I am never nervous. I am able to forget that there is an audience, and I focus all my energy on making music. I love being able to look at the other musicians, whether they are professionals, volunteers or my students, and knowing that my job is to inspire them to make their best music together. It is not about me, but about teamwork and collaboration. Talk about The House of Clouds. The House of Clouds is an organization Colin Britt and I began with another Yale classmate, Debi Wong. We all felt passionate about using our music making to raise money and awareness for organizations in need. I sometimes would look up at audiences and think, “If every person here gave a dollar toward homelessness, what a difference that could make.” House of Clouds has now held benefit concerts all over the country, and we hope to continue this by performing with 3 Penny now that it has gained so much national attention. What have been some of your proudest musical accomplishments? My proudest accomplishments are not on the stage or TV, but actually in my classroom. I think I am most fulfilled when I see a student begin to fall in love with music. When I can get one kid hooked on singing, it feels so wonderful.